Those who have read my article on Non Technical tips on CCIE Troubleshooting and who are following my Technical tips on CCIE Troubleshooting would be wondering why I have chosen to write an article on NTP after writing a post on Troubleshooting MPLS VPN. 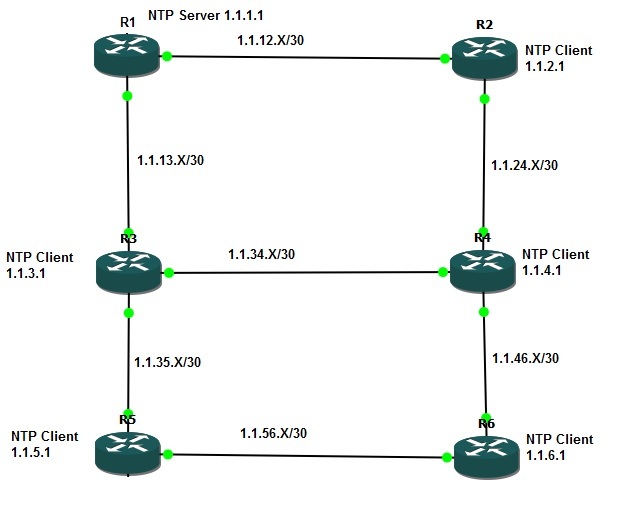 NTP is trivial as compared to MPLS VPN, so why not the new post on BGP or OSPF? The message I want to send home is that no topic is simple in CCIE. I thought NTP is easy and did not practice it and during Lab, this simple topic caused me to go blank because without practice, there is no strategy and without strategy you don’t know what to do. In this article we will see few scenarios with regards to troubleshooting NTP in a Cisco network. The setup is pretty straight forward with 6 routers having IGP running between each other. The ip address is as given in the diagram where X is the router number. Also, the loopback ip address is as given. There are 5 independent requirements that have to be met. R5 should get authenticated time from R1. Although I am not in favor of using show runs to troubleshoot an issue, I will still use it to highlight the disadvantage of using it (yet some times it is the only thing which helps you troubleshoot). Lets see a show run of R1 with regards to NTP. From this output we come to know that NTP is configured but it did not sync with R1 for time. There are 2 possible reasons for this. One is that NTP is not able to communicate with R1 1.1.1.1 and the other is authentication failure. Let us see whether we can get anything from debugs. We have started debugs for NTP authentication, validity and packets. You will have to be patient here because everything in NTP takes time so will the debug. From this debug we see that NTP is transmitting packet but it is not receiving any. So there has to be some place where NTP is being blocked. After checking the routing table, the first upstream device towards 1.1.1.1 is R3. Let us see the ACL on R3. So our time is synced and it was NOT a case of wrong password. R6 should get authenticated time from R1. Let us see the show runs to get an idea of what is present in R1 and R6 regarding NTP. So our time is synced and it was a case of wrong password. (Note1: We have unlimited time now due to which we decrypted the hash back to plain text password but this is not the appropriate way to resolve authentication issue where time is limited. If you find such an issue and you don’t have time, you must remove the keys from both the server and client and put your own common password on both the routers. R3 should get authenticated time from R1. Let us see the show runs to get an idea of what is present in R1 and R3 regarding NTP. According to the debug “Authentication failed” but according to sh ntp association details command authentication passed, this case only happens when the ntp trusted-key 1 command is missing. Let us put the command and see whether ntp syncs time or not. So our time is synced and it was a case of missing commands. R4 should get authenticated time from R1. Let us see the show runs to get an idea of what is present in R1 and R4 regarding NTP. R2 should get authenticated time from R1. Let us see the show runs to get an idea of what is present in R1 and R2 regarding NTP. The time seems to be synced with R1 but our requirement is not completely met. We want authenticated time from R1. We must observe the show run here as to why R2 synced time without authentication. The key command here is ntp server 1.1.1.1. R2 is not asking for authenticated time so it will not be given that. Let us change the config so that R2 asks for authenticated time. So our requirement is met. This entry was posted in Everything Cisco and tagged access list, ACL, Authentication, Client, debug, hash, md5, NTP, password, server, show, Troubleshooting, Trusted Key by samirsogay. Bookmark the permalink.